Population Transfer in Perspective Avigdor Lieberman speaks out. In an exclusive interview with The Sunday Telegraph, Avigdor Lieberman, Israel's Minister for Strategic Affairs, said that the primary way to achieve peace in the Middle East would be for Jews and Arabs - including Israeli-Arabs - to live separately. “Minorities are the biggest problem in the world," he claimed. Asked if Arab Israeli citizens should be removed, he said: "I think separation between two nations is the best solution. Cyprus is the best model. Before 1974, the Greeks and Turks lived together and there were frictions and bloodshed and terror. After 1974, they constituted all Turks on one part of the island, all Greeks on the other part of the island, and there is stability and security." When reminded that these people were removed forcibly from their homes, he replied, "Yes, but the final result was better." Later, Lieberman explained, "Israeli Arabs don't have to go…. But if they stay they have to take an oath of allegiance to Israel as a Jewish Zionist state." 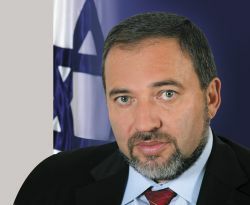 Lieberman’s remarks set off a firestorm of criticism in the Knesset and around the country. Whether you support Lieberman or find his proposals abhorrent, they should be seen with a historical perspective. After World War I and II, transferring populations was considered legal and moral, and the most favored response to inter-ethnic strife. This is no longer true. Population transfer is now seen as illegal and a crime, notes Eyal Benvenisti, professor of Law at Tel Aviv University. As Benvenisti points out, the first population-exchanges involved Bulgaria, Greece and Turkey. The Treaty of Nueilly of November 27, 1919 provided for 46,000 Greeks from Bulgaria and 96,000 Bulgarians from Greece to switch countries. After the defeat of the Greek army in the Greek-Turkish War following World War I, and the Turk assault against Greek communities in Turkey, Greek refugees began fleeing their homes in Turkey. Greece and Turkey exchanged of populations with about 2,000,000 Greeks who were Turkish citizens and about 500,000 Turks, who were Greek citizens. The exchange of populations had worked so effectively, Benvenisti observed, that in post-World-War II, the Allies decided to transfer 15 million Germans living in Eastern Europe, primarily in the Eastern part of Germany, after it had been granted to Poland. According to the Potsdam Declaration, Germans living in Poland, Czechoslovakia, Hungary and Austria were to be transferred to Germany "in an orderly and humane manner.” Although the West attempted to ease the transition, there was much distress and suffering, as well as large numbers of deaths. After the borders in Europe were redrawn, smaller transfers were made in parts of Central and Eastern Europe. Population transfer was also used in 1947 to settle the inter-religious enmity between Hindus and Muslims in British India. Once it became clear that the communities could not live together, the sub-continent was partitioned into two states – India and Pakistan – requiring the resettlement of millions of people. Mass transferring of populations by states is no longer acceptable. When Turkey invaded Cyprus in July 1974, Turkey was condemned for the large numbers of Greek and Turkish Cypriots who were displaced after being forced to flee from their homes. After atrocities were committed in the former Yugoslavia, people began using the term “ethnic cleansing” to describe the uprooting and displacement of populations, which was identified as a war crime. A process that was sanctioned, if not legal in 1948, is now regarded as criminal. The most recent example of forced mass transfer, Benvenisti continues, occurred in Cyprus with the Greek-Cypriots and the Turkish-Cypriots. After Turkey invaded and occupied the northern part of the island, more than 200,000 Cypriots fled or were relocated across the "Attila Line," set up by the Turkish military. Greek-Cypriots left the Turkish-occupied zone, while Turkish Cypriots escaped to the north, where they moved into homes abandoned by Greek-Cypriots. The Greek-Cypriot refugees resettled in the southern part of the island, a number on property owned by Turkish-Cypriots. The right to recover property and the right to return are two of the key obstacles to settling this dispute. For numerous reasons, the transfer never took place. In his book on the international proposals to transfer of Arabs from Palestine, Chaim Simons found that a number of leading Zionist leaders entertained such ideas, as did president Franklin Roosevelt and Herbert Hoover, Czechoslovakian President Benes, and three Nobel Peace Prize winners Sir Norman Angell, Christian Lange and Philip Noel-Baker. An historian, Dr. Grobman’s most recent book is Battling for Souls: The Vaad Hatzala Rescue Committee in Post War Europe. He is also co-author of Denying History: Who Says The Holocaust Never Happened? His most recent book is Nations United: How the UN is Undermining Israel and the West.